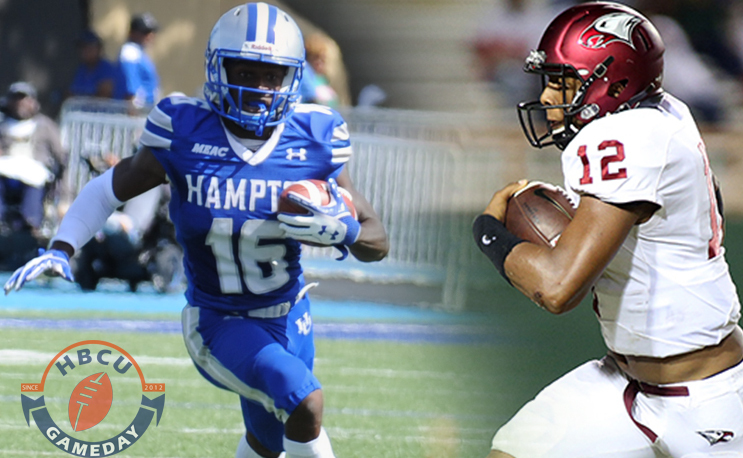 Both Hampton and N.C. Central are looking to stay in the MEAC title race, but one team’s chance will take a hit on Saturday. Depending on who you believe, Hampton football coach Connell Maynor could have easily been coaching on the other side of his team’s crucial matchup against North Carolina Central this week if things had transpired differently four years ago. Maynor was the hot name in black college football circles in late 2013. He had just led Winston-Salem State to a third-straight season with at least one playoff win, and had a 45-6 record that included just three regular-season losses in four years. NCCU was looking for a full-time replacement for Henry Frazier, a promising coach it fired prior to the season after a string of domestic violence arrests. It is widely assumed that Maynor was NCCU’s top candidate. He interviewed for the job, but eventually crossed the border into Virginia and took to the task of rebuilding the Hampton program. NCCU, meanwhile, went with a first-timer in Jerry Mack and the rest, is history. Since then, Mack and his teams have thrived, sharing the MEAC title in 2014 and 2015 and winning it all last season. Maynor’s teams, meanwhile, have struggled to get over the hump of facing his alma mater (North Carolina A&T) and his college rival (NCCU), as the Fayetteville, NC native’s teams are 0-5 against teams from his home state. But enough of history, lets stick with the present. Hampton returns home to face NCCU with a 4-1 MEAC record, having suffered its first setback in the conference last week against Bethune-Cookman. NCCU, meanwhile, suffered its first conference loss in two years two weeks ago against Norfolk State. Hampton is one of those teams that does nothing great, but everything pretty good. It leads the MEAC in exactly zero statistical categories but ranks high in several categories, including scoring offense (22.4) and scoring defense (22.2) ranking fourth in both categories. Its offense is built around the running game, as Yahkee Johnson is currently third in the conference in rushing with 594 yards and teammate Shai McKenzie has 408 yards rushing, good for ninth in the conference. Conversely, NCCU’s defense excels at stopping the run, as it is ranked third in the conference. However, its pass defense is slightly more vulnerable as it is currently ranked eighth in the league and gave up four touchdown passes to true freshman Juwan Carter in its loss to Norfolk State. The key for both teams will likely be getting the passing game going. Eagles freshman quarterback Chauncey Caldwell has been pretty careful with the ball so far this season, turning the ball over just twice in eight games. He’s also a dual-threat with his feet, however, something that the Pirates will have to look out for. Pirates quarterback Delmon Williams has been solid, if unspectacular, completing better than 56 percent of his passes for 12 touchdowns and just five interceptions. To quote North Carolina A&T coach Rod Broadway “the bottom line” is that the loser of this game pretty much eliminates themselves from a shot at a MEAC title. Especially Hampton, who doesn’t play A&T this year. A&T is still the leader of the pack thanks to its unblemished record, but if NCCU wins out it will at least get a share of the MEAC title and possibly more. If it loses, it can still play spoiler against its rival to end the season and hope that it picks up another loss somewhere. We’ve seen in the past that almost anything can happen at the end of the regular season in the MEAC, but no one wants to get that far behind the eight ball this late in the game.The stakes couldn’t be much higher than they are right now.